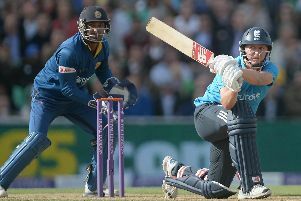 Stuart Broad ranks England team-mate Joe Root as "the most complete batsman" he has played with. Root struck a career-best 254 against Pakistan at Old Trafford last week, his 10th Test century at the age of just 25, and followed up with an unbeaten 71 in the second innings as England squared the series 1-1. Root's marathon efforts in Manchester put an end to what had been a modest summer by his own standards and left team-mates and pundits purring. What sets Root aside from most of his team-mates is an ability to play similarly important innings in 50- and 20-over cricket, leaving him to vie with other three-format stars such as India's Virat Kohli, Australia's Steve Smith and New Zealand's Kane Williamson on the world stage. And nobody is more impressed than Broad. While Broad jokingly suggested Root would not be his pick for a life-or-death rearguard, the Yorkshireman's range of skills earned him top honours. "I think Joe's probably the all-round, complete player," said Broad. "I think in 10 years' time there's no doubt we'll be sat with a glass of red saying, 'wow, I'm lucky to have played with that Root fella - look at his record in all formats'. "If I had to pick two batsmen to bat for my life, I'd pick Alastair Cook and Jonathan Trott, but I think Joe is probably the most complete batsman I've ever played with. "He has fewer weaknesses - he's a fantastic player of spin, a good player of the short ball, a good player of quick bowling. "He is a brilliant team-man in the way he plays and he's got every tempo and every shot in the book. "I mean, the bloke averages 56 (in Tests) and I'm sure 300-odd in the last match helped." Broad knows all about the vagaries of form, having waxed and waned throughout his international career, and was careful not to curse his team-mate ahead of next week's third Test. And while it is barely a couple of weeks since Root was twice left berating himself for two ill-judged dismissals at Lord's, Broad does not anticipate a repeat. "It's always dangerous to blow too much smoke, but he's just scored 300-plus in a Test and he'll be on the crest of a wave," he said. "He's a very rounded guy and I know he'll be desperately hungry to get another big score next week. "He's had a relatively quiet summer, and he was getting a little bit frustrated. You could tell when he was getting out, he was walking off and whacking his pads and he got out in a few quite odd ways for Joe. "For him to rein in his shots slightly and just say, 'I'm going to bat big', was a great example of how to put the team first. "He knew that first-innings runs were going to be vital at Old Trafford and he did it in a no-risk way. "I think that was one of the best knocks I've seen for England."